Used but very good condition BMW cocomats - black and tan. $125 shipped within continental US. 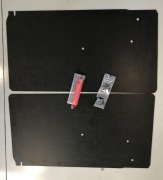 Brand new never installed door cards and pulls from Condor Speed - https://www.condorspeedshop.com/collections/2002-parts/products/black-abs-plastic-door-cards-2002-coupe?variant=230205587457 Cost $156 plus shipping. Selling for $120 including shipping within continental US. Bought 2 new salt and pepper #1 carpet kits from Esty for two roundies. Installed one but going in a different direction on the other car so selling the second carpet kit. Still brand new in box, never even unpacked. Pics of first kit installed attached as example and pic of the kit for sale in the box. Cost $392 shipped to me, selling for $325 shipped.